In December 2009 Microsoft bought the leader in datacenter automation and his famous product “Opalis Integration Server”. Using Opalis you can fully automate provisioning in your datacenters. For example, building up a Virtual Server without any interaction in just a few minutes or adding a new user to all your systems with just a single click. All of these tasks are done using a little process. The processes are build using drag and drop. 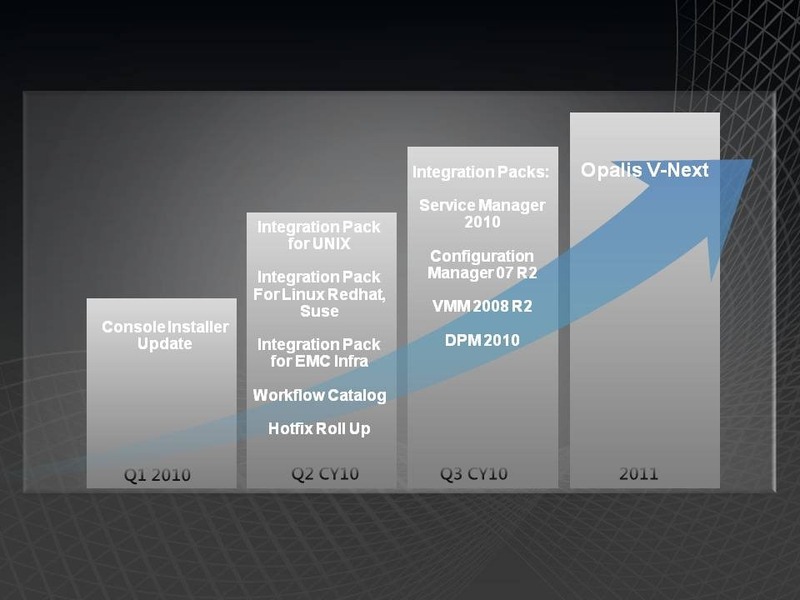 Microsoft has now released a roadmap of the integration of Opalis into its System Center products. As shown in the picture, the first step is to update the installer. At the moment it is a JBoss with several Java classes to download from all over the internet for get it up and running. Next steps are to build adapters for known systems to natively support them. As a person from the technical support line claimed, it is will be available over software assurance in the late 2010. The release of vNext with fully integration into the System Center family is planned for 2011. More information will follow later on, perhaps after the MMS 2010.